The Lucas Bros. Moving Co.
With the second season of their animated show, Lucas Bros. Moving Co. airing now on FXX, The Lucas Bros. are riding high. 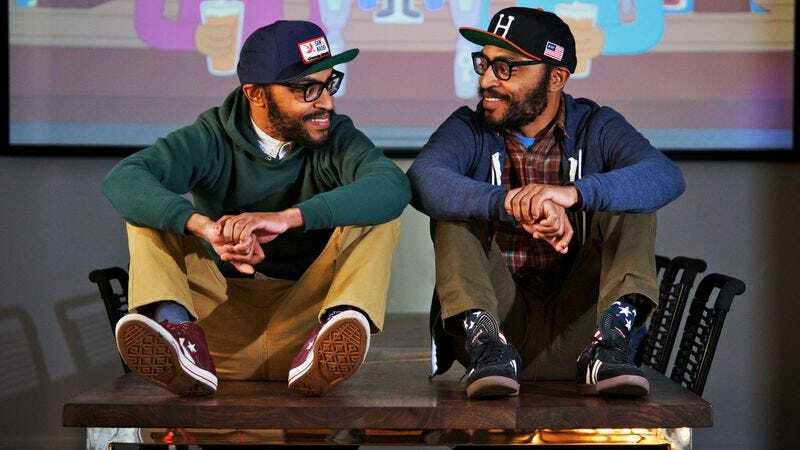 Twins Keith and Kenny Lucas not only perform stand-up together, but also appear together in most projects, from 22 Jump Street to Friends Of The People, their weekly sketch comedy show for TruTV. They’ve also appeared on both The Tonight Show With Jimmy Fallon and Late Night With Jimmy Fallon. 1. What’s the worst job you’ve ever had? Kenny Lucas: I worked at a Mexican restaurant called Chevy’s in New Jersey, and it really sucked. I was a waiter, and I’m just too lazy for that. I don’t do service jobs very well. The A.V. Club: How long did you work there? Kenny: I worked there for approximately two months. And I did it because it was right after college, so I was just trying to make some money to save up for law school. I figured I would just work as a server and see what happened. And it was bad because you’re just at the mercy of the customers, and sometimes they can be jerks, and some of the tips were horrible, and it was long hours. It was brutal. AVC: And you’re at the mercy of the economy and the shifts you get, too. Kenny: Absolutely. If someone comes in and they had a bad day and they don’t want to give you money, that’s that. Keith Lucas: We both worked as telemarketers for this shady third-party cable provider. What was the name of it? Keith: And transferring. And it was the worst thing ever, because people would think they were calling Cablevision or Time Warner, but they’re really just talking to some person who has no idea what their account is about. Keith: Yeah, we would sell them this shady insurance. That was the role of Saveology. Keith: I wouldn’t say that it was illegal, but we would sell this Geek Squad type of insurance almost that wasn’t real. It was like $9.99 a month, and it was the most shady thing I’ve ever done. Kenny: And the hours were crazy. Keith: The hours were brutal. 2. When did you first feel successful? Keith: That presupposes that I feel successful. I don’t really feel successful yet. I feel like there’s a lot of work to be done, right? What do you think? Kenny: I think I get the question. I think the moment that we can objectively say that we were kind of successful was when we were at the table reading with Jonah Hill and Channing Tatum [for 22 Jump Street]. And I never in a million years thought that I would meet these guys, because they’re such mega-superstars. Keith: All right, that’s fair. AVC: Did you have a trailer on set? Keith: Yeah, we had a trailer. Kenny: Once we got the trailer, I was like, “oh yeah.” It was like Ice Cube, and then us. His trailer was a lot bigger than ours, though. 3. If you were a supervillain what would your master plan be? Kenny: I would try to rid the world of every reality TV show. It would make me a hero. AVC: But I think to some people—reality TV producers, for instance—that’s something a supervillain would do. Kenny: For some people. A lot of people love reality TV. So I think I would try to wipe out all reality television and kidnap all the stars made famous from reality TV and hold them in a prison. Again, that’s either a good thing [or not], depending on your perspective. Keith: I would destroy everybody’s cell phones. Keith: Yeah, exactly. Supervillain. No more cell phones. Keith: Because as a supervillain my goal is to make people’s lives inconvenient. And I feel like once I get rid of people’s cell phones, life would be super inconvenient. I’m diabolical. AVC: Would you keep one? Keith: I would keep one, for sure. I would keep everybody’s cell phones. I don’t know where I would store them, but I would have everybody’s phones. Kenny: Who would you call? Keith: I would call myself! AVC: You could just keep the Internet on and use Google Maps and stuff. Keith: I would be the most efficient person. It would allow me to do my diabolical plan once I have everybody’s cell phone. I would be able to execute it. 4. What were you like as a kid? Kenny: I’ll describe Keith. He was a wild child. He was all over the place. I think he might have had ADD or some type of thing. He was fun, though. He was more fun to be around then than he is now. Keith: When he says wild he means as wild as a Lucas brother can get. Not like crazy wild. Kenny was very shy, very to himself, really good at math. We weren’t like super popular, but we had a core group of friends and we loved wrestling. And we watched wrestling all the time, like our childhood revolved around wrestling. That was the center of our childhood. We watched Monday Night Raw on Mondays, Smackdown on Thursdays, and then we would watch Superstars on Saturday, and then Sunday night, what was it? Keith: Challengers, but then they also had the other show on Sundays… Do you remember the other show Sunday night? Keith: I forget the show. Forget it. But then we started watching WCW and all the Pay-per-views. It was wrestling all the time. AVC: Do you still watch wrestling? Kenny: We do. We’re those guys who still sorta kinda watch it. Keith: We do still watch it. We actually just watched the Royal Rumble last week. All of it. So, yeah, we’re still very much into it. 5. Who was your celebrity crush when you were younger? Keith: I mean, Tiffani Amber Thiessen from Saved By The Bell… who else? Kenny: I liked Scary Spice from the Spice Girls. She was beautiful. Kenny: She is beautiful. Um… Patti Mayonnaise from Doug. Keith: Oh yeah. That’s awesome. Kenny: She was a cool girl. She was a cool person. She was very independent. Keith: I liked her voice. Kenny: Her voice is fantastic. I loved everything about Patti Mayonnaise. And she has a great name. Her name is fantastic. 6. If you had entrance music, what would it be? Keith: We used to do backyard wrestling, and this one guy, his theme music was “Peaches” by The Presidents Of The United States Of America. I always liked his entrance music, so I would go with that. And it’s my mom’s nickname. Keith: That’s dope. I like that. 7. What have you done so far today? Keith: I woke up, I checked Twitter, I read some Google news, read a little bit about ISIS, which was depressing. And then I started taking interviews. Kenny: I made a smoothie, and I checked Twitter. I read The New York Times, and started doing interviews. I didn’t read about ISIS, though. I read about that Metro crash. I also found out that the Silk Road dude got convicted on all of his charges, so he’s probably going to prison for life. 8. What other celebrities have you been mistaken for? Keith: We get mistaken for Andre 3000. Keith: Yeah, I know, I don’t see it, but people say it. Kenny: He’s also much darker. I don’t know. AVC: And he’s probably wearing like a three-piece suit made out of garbage bag. Kenny: He’s such a better dresser. He looks richer than us. I don’t know what people see. We got Tiki and Ronde Barber when we were in high school, but I think that’s because we’re twins, and they’re twins. Keith: And we used to shave our beards, so we looked a lot more like them. 9. If you had to find another line of work, what skills would you put on your resume? Kenny: I don’t know if I have any more skills. I’m a good communicator. I can talk to people. If I ever wanted to go back into telemarketing I think I’d be much better at it now. I’m pretty persuasive, so I can sell stuff. I think I’ve got a future in business somewhere. Keith: I’m pretty good at surfing the Internet, so anything that involves surfing the Internet I could do pretty well, but I’m guessing most of us are good at that. I’m a decent—I’m not a decent typer, I was about to lie. I’m good at texting, so are there any jobs that involve texting? AVC: You could work at a cell phone company. Keith: There you go. Cell phone company. I’m good with my cell phone, and I’m good at reading, so anything that involves reading a lot. Kenny: You could be a professor. Keith: I don’t know about a professor, but I can research at the library. I could be a research assistant. Kenny: You could be a librarian. 10. Do you collect anything? If so, what? Kenny: I don’t think I collect anything. Keith: You don’t collect anything? Kenny: No. I mean I used to collect wrestling action figures. But I stopped doing that 15 years ago. Keith: I don’t really like a lot of junk. Kenny: I always throw things away. I hate having so much stuff so I throw things away. I guess I collect movies. But I collect them on my laptop, so I don’t have the physical form of them. But I download a lot of movies and just save them. Keith: And why? I liked to be entertained I guess. AVC: Do you guys live in New York? Kenny: Yeah, we live in New York. And we also move around a lot, so it would be a challenge. AVC: It’s hard to collect things in New York, because space is at such a premium. Keith: Rent’s always going up so you’re always jumping around to different places, and things just get lost. It’s very tough to keep things together. 11. What would your last meal be? Kenny: It’s going to have to be soul food. It’s going to be macaroni and cheese, fried chicken, mashed potatoes, candied yams, and corn bread. And collard greens. Keith: I think I’m going to go with a nice steak. Maybe a T-bone steak with mashed potatoes… no, not mashed potatoes. A baked potato. With sour cream and butter. Keith: Probably an ice cream sandwich. Kenny: Pecan pie with ice cream. Keith: Oh, that’s sick… I want pecan pie with ice cream, too. Kenny: Like a famous historical figure? I would be Dr. King. Keith: Why would you want to be Dr. King? Kenny: Here’s why: I think the ’60s were a fantastic time. And he was so involved in everything. He got to meet amazing politicians and presidents, and he was so on post with things like really important social movements. If not Dr. King, Ralph Abernathy. If I can’t be Dr. King. Kenny: Yeah, but I’d rather go down as an icon. Keith: Ralph Abernathy is an icon! Kenny: Not like Dr. King. Keith: That’s fair. Dr. King is an inspiration, sure. I’m going with Lyndon Baines Johnson. LBJ. For all of the reasons Kenny picked. He was a very instrumental figure in the ’60s, and I believe that he was one of the most effective presidents, and he was tall. So that would be cool. To be tall. AVC: What would you guys like to ask the next person? Keith: Okay. I was going to do: If you were a professional wrestler, what would your gimmick be? AVC: What would your gimmicks be? Kenny: I think we’d be stoners. We’d be called the Kushwackers, and our fancy move would be the 420. Keith: Yeah. It would be a 420 splash off the top rope. AVC: As stoners, you’d just kind of fall of the top rope.